With its craggy hills and mountains covered in dense rain-forest, Guatemala is one of those unique countries that you have to visit to believe just how astoundingly beautiful it is. Most people will have heard of Guatemala thanks to its coffee trade and premium cocoa (cacao) production – a plant that has been cultivated in Guatemala since ancient times and is the origin of our modern love for chocolate. 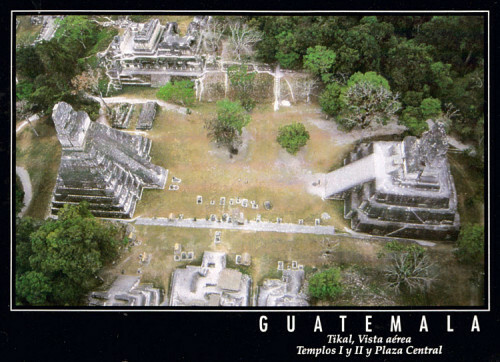 There is of course one more renowned asset that Guatemala lays claim to, the Mayan Civilisation, for whom Guatemala was their heartland. Today, Guatemala remains a rural retreat amongst breathtaking mountainous rain-forest packed with flora and fauna, the breadth and depth of which you would struggle to find elsewhere in the world. Thanks to its remoteness, Guatemala has maintained a remarkably indigenous feel, making you feel millions of miles and hundreds of years from home. Guatemala is unique amongst the countries of Central America because the greater percentage of its population is indigenous and directly descended from the Maya. 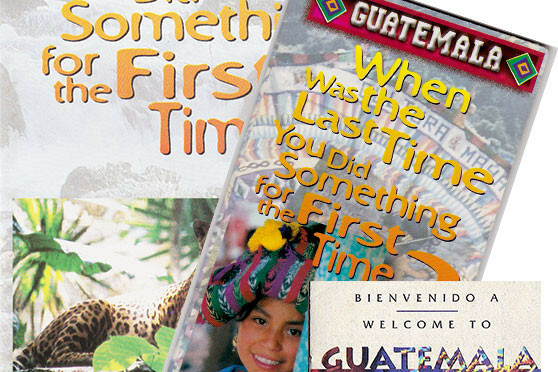 Guatemala was at the heart of the Mayan territories, which stretched from the Yucatan Peninsula in Mexico, through Belize and Guatemala, and down to Honduras and El Salvador. 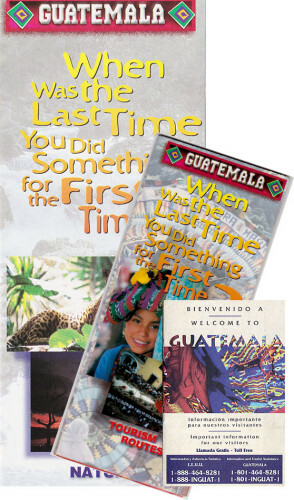 The name Guatemala translates to “place of trees” and the thick forestation created an impassable terrain for the conquistadors, especially in the Peten region to the north where the Itza Maya maintained their independence from the colonial onslaught for almost 200 years before they finally seceded in 16971. Unlike neighbouring Mexico, it remained secluded from colonisation, again thanks to its terrain, and remained largely undeveloped and cut-off from European interests. Guatemala gained independance from Spain in 18212, barely a century after falling completely under their rule. Following independence, civil wars and a lack of financial stability stunted Guatemala’s development. Part of the country was annexed and sold to Britain in exchange for the construction of a road from Guatemala city to the new country, now known as Belize. The road was never built, partly due to the continued unrest within Guatemala, and compensation was never paid by Britain either, which is still a contentious issue. In the 1970s, Guatemala was again gripped by civil unrest and as many as 50,000 people were killed in the fighting. Peace was finally brought about in 1996, by which time approximately 200,000 people had lost their lives and Guatemala was economically, technologically and socially several decades behind the rest of the world. Bus to Lake AtitlanSad though this turmoil is, it has meant that Guatemala is now one of the most unspoiled and picturesque countries in the world and therefore a travelers’ paradise. 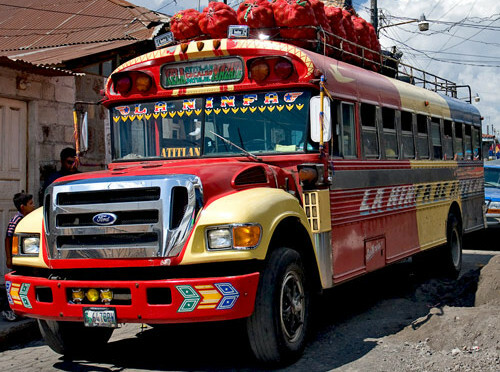 Perhaps the only downside to Guatemala’s lack of development is its infrastructure and anyone who has traveled around Guatemala will remember it for the white-knuckle bus rides along the precarious mountain roads in brightly painted converted US school buses (read more…). However, you will soon forget the exhilarating bus journey if you are headed to the shores of Lake Atitlan, for there you can relax in pure tranquility and do little more than wander the lonely paths of this remote paradise and muse at the hoards of coffee beans laid out to dry in the sun on the roadside. If you wish to maintain a modicum of westernised comfort then stay in the travelers’ towns of Panajachel and Santiago Atitlan. The latter is home to the “naval of the world” which is now found in a Christian Church, but was initially a Mayan Shrine to the underworld and the spirits of the ancestors. Lake Atitlan itself is the mythical birthplace of the Maya, and it is often referred to as the “womb of the world”, a legend that is undoubtedly based on the shape of the lake. 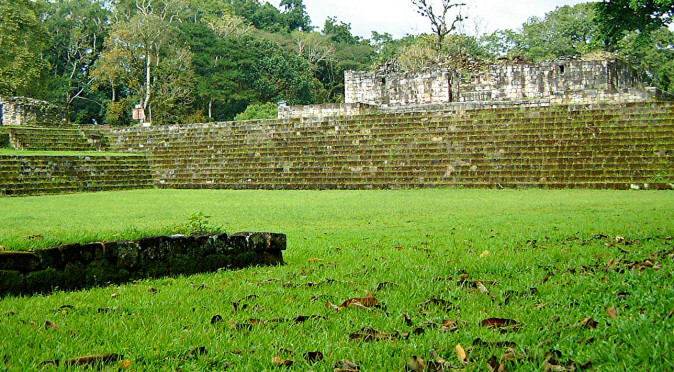 Ultimately, Guatemala’s Mayan history is probably its most defining and redeeming feature and the Reserva de Biosfera Maya is a huge national park in the northern region, Peten, which includes hundreds of acres of jungle and the ruins of Tikal. Tikal stands out as one of the wonders of the ancient world and an essential stop off for anyone remotely interested in history or biology. 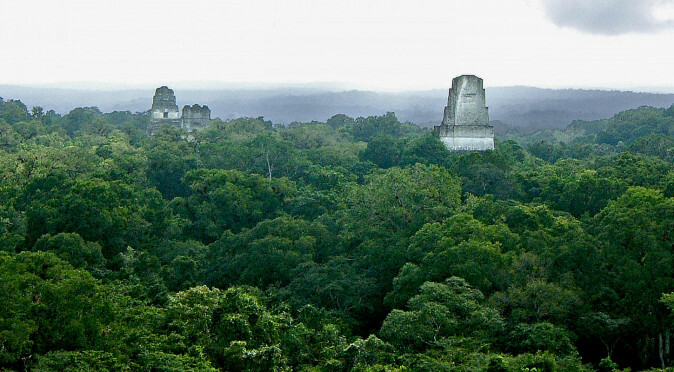 Tikal was the centre of the Mayan empire for well over a millennium before its rapid decline and abandonment in the 10th century. After then, despite its dominating temples reaching high above the jungle canopy, it was incredibly lost to the jungle until the 19th century when the expeditions of John Lloyd Stephenson uncovered its mysterious grandeur and reported back to Europe. You can stay within the park, but you should also stay at least a night on the bizarrely tiny island of Flores which is only a couple of hours bus ride on the south side of the picturesque Lago Peten Itza. 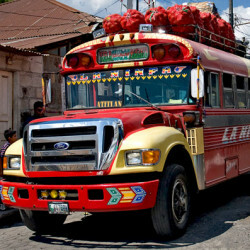 Guatemala's buses are a colourful delight, but things may not appear so attractive once you are on-board!